What is great about QuickLook is that developer's can create plugins that add functionality to it. FLV files are not natively supported by QuickTime, but the Perian plugin solves that. If you have Perian installed, you can also install a plugin that lets you view FLV files in QuickLook. It is very useful if you use an FLV downloader to download videos from online video websites like YouTube, Google video, etc. The plugins needs to be installed in /Library/QuickLook/. You can download it here from the developer's website (the website is not in English, but the link on the developer's website is called "flv.qlgenerator 0.1" (direct download link)(Perian is required)). You can also check out my review of Knoll Light Factory from Red Giant Software here on RandomlyMac. When you open a read-only folder in the Finder, this icon appears in the lower left corner of the window: It appears when you open a CD/DVD, but also with a locked folder. This is somewhat hard to describe, but I am talking about the arrow at the right of the name of a song in iTunes. Usually, if you click on it, it loads the iTunes store at the page where you can buy the song. If you hold down Option when clicking on the arrow, however, it will show you the whole album not in the iTunes store, but in your iTunes library. The Genre, Artist and Album column will also appear. By default when printing a webpage, a header and a footer containing info such as the URL is included. 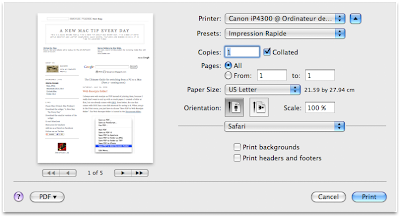 If you want what you printed to look more like a document than a webpage, you can use a feature in Safari that omits the header and footer. To do so, uncheck "Print headers and footers". I always save web receipts as PDF instead of printing them, because I really don't want to end up with so much paper. I created a folder at first, but one already comes with OS X. Even better, the one that comes with OS X has a one click shortcut for saving to it. 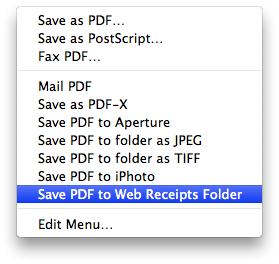 When you go in the Print menu, you just have to choose "Save PDF to Web Receipts folder". The Web Receipts folder is located in the Documents folder. 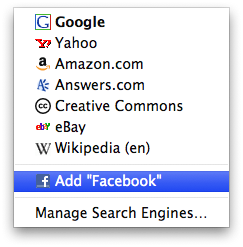 The green button in the upper left corner maximizes or resizes the window to the optimal size. I really don't like the way it works in web browsers and most other applications, but it is completely different in QuickTime. It will actually resize the window to the "Actual Size". What is even better is that unlike other applications, it remembers the size the window was before resizing and clicking it again will resize it back. I talked a lot about editing photos in Aperture, but now that many point and shoot cameras capture RAW, working with RAW in iPhoto is also useful. 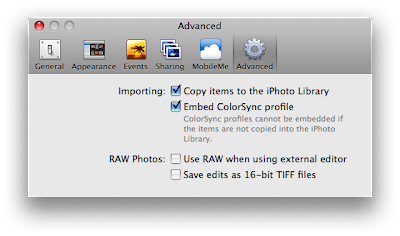 iPhoto supports RAW by default, but you do lose a lot of quality when you edit the files. The problem is that files are converted to JPG for editing. In the advanced preferences, enabling "Save edits as 16-bit TIFF files" will solve this problem. The advantage is that the RAW files will be converted to a much higher quality TIFF instead of JPG for editing. I didn't even know this existed until I accidentally hit Command-T in iTunes and it enabled it. I actually thought it was a bug or an easter egg when I first saw it and I only realized it is a "feature" when I saw it in the View menu. I guess it is cool if you want to be completely distracted form your work! A tip that I noticed is that it changes completely if you disable it and enable it again. It doesn't start where it left off. A much quicker way of restarting it though is to simply resize the window. It will basically do the same thing. By the way, I upgraded my unlocked iPhone to 2.0 with Pwnage and it worked great. The steps are really easy. It is now much easier then when I unlocked 1.1. Drag and drop text on the Mail icon! If you want to copy and paste text and send it in an email, there is an easier way. It is by using the Mail dock icon. You just have to drag and drop the text onto the Mail icon. It will automatically create a new email with the text you selected in the body of the email. Adium combines messages from the same person in a single box. The only problem is that only one timestamp is indicated at the top for all messages. The last message could have been sent hours later and still appear in the same box. In the latest version of Adium however, you can mouseover a message and have the timestamp of that specific message appear. I never really went through dotMac preferences and I now wanted to see what has changed with MobileMe. I found the iDisk sync. I googled it and realized that it was there in dotMac. I still think it is pretty cool. What it does is it keeps a backup of what is on your iDisk folder. On top of being a backup, it lets you access your iDisk offline. You can even copy to your iDisk offline and it will be synched back to MobileMe once you have internet access. It can be enabled in the MobileMe preferences. Deselect All in the Finder! 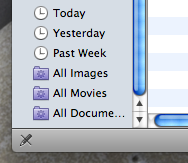 In the Finder, a pretty well known feature is Select All that is Command-A. Command-A works in most applications, but a modified version to Deselect All works only in the Finder. To deselect all, you simply have to add Option. It is then Command-Option-A. Backing up the iPhone's SMS! The iPhone has an SMS limit of 1000 SMS even though you have a lot of space remaining. You might want to backup these SMS before erasing them though. What is great is that SMS are automatically synched by iTunes. Applications like MobileSyncBrowser (donationware) and Syphone (free from Micromat) can do this quite easily. I was somewhat disappointed by both, but they are still useful and they can get the job done. The free Syphone doesn't support well accented characters and it didn't recognize my iPhone at first. I finally checked the support forum and resolved the issue by synching the iPhone with "Run helper app in the background" and unchecking it after to make the SMS appear. A problem that I found on both apps is that incoming and outgoing texts are separate. Both apps are still useful and I think if you can get Syphone to work, it is a great option because it is free. 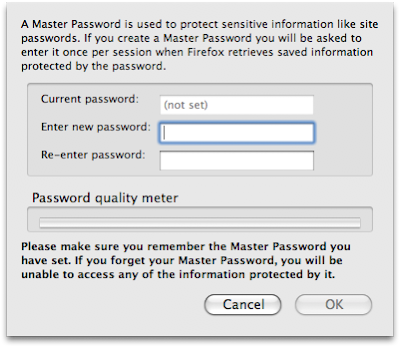 Master password in Firefox, not in Safari! Firefox has a useful feature that doesn't seem to be available in Safari. It is the master password. It offers an additional level of protection if you choose to have Firefox save your passwords. 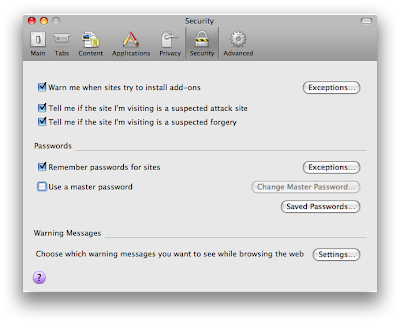 Having your browser save passwords can be risky if someone gets access to your Mac. If you set a master password, Firefox will ask you for your master password at every session where you want to log in with a saved password. The advantage is of course that one password is a lot easier to remember. You can set the master password in the Security tab. 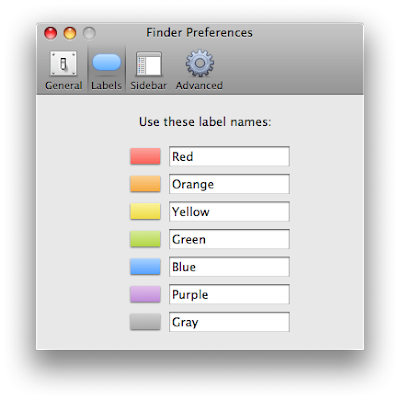 You can change the names of color labels of the Finder in the Finder preferences. Using this, you can adjust the color labels to your work and to your workflow. To go to the Finder preferences, make sure your are in the Finder and go to Finder, Preferences... The color labels preferences are in the "Labels" tab. It is not really that useful, but it looks cool! 1. Right click (control-click) on the toolbar and choose "Customize Toolbar...". 2. Add the "Rotate Browser" to the toolbar. Locked files in OS X! OS X lets you lock file and it can be very useful if you want to make sure you don't accidently delete them. To lock a file, go to Get Info, or Command-I and check the checkbox next to "Locked". OS X will warn you if you try to put a locked file in the trash and once it is in the trash, you'll have to hold down Option while choosing Empty Trash to actually delete the file. 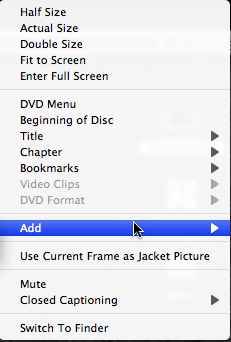 DVDs already have chapters by default, but it is also possible to add markers to specific locations on the DVD. They are bookmarks in DVD Player. Of course, DVDs are read-only, so they only apply to the computer you are adding them on. To add a bookmark, you just have to right-click on the video and choose "Add" and "Bookmark...". Parental Control in DVD Player! 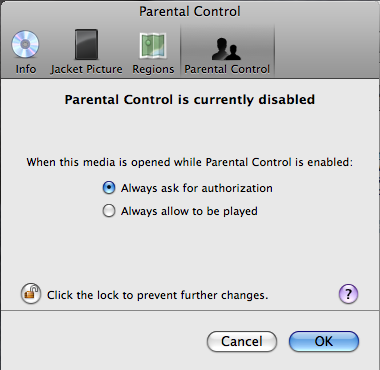 OS X 10.5 Leopard brought the new Parental Control feature. This feature is also incorporated in DVD Player. You can actually add permissions to specific DVDs. To do so, you have to go to the disc info in the File menu (Get Disc Info or Command - I from DVD Player with a DVD playing). The feature is then in the Parental Control tab. 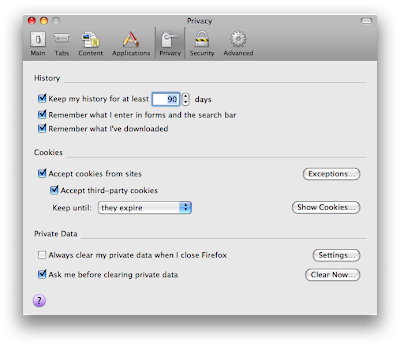 The "Reset Safari" in Firefox! If you are following me on Twitter, you'll know that I am switching to Firefox as my primary browser and will keep using Safari as a secondary browser. One feature in particular that I really liked in Safari is "Reset Safari", because it doesn't reset everything, it lets me uncheck things that I don't want to reset. A similar feature is present in Firefox. 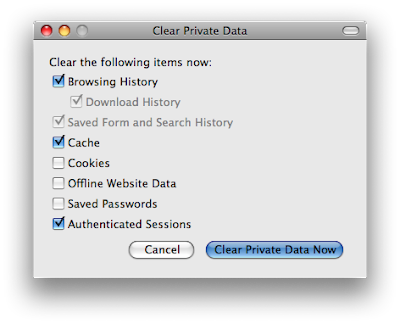 It is in the Preferences, in the Privacy tab. The feature is "Clear Now..." for the Private Data. Just like Safari, it will let you choose what you want to reset. Time Machine is a great backup solution, but it is unfortunately not bootable. It is really why alternatives like SuperDuper or Carbon Copy Cloner are still useful. The advantage of a bootable backup is that in case of a failure, you don't have to wait and resetup the whole thing, you can simply boot from the external backup (with firewire) and continue working. Carbon Copy Cloner can also be very useful if you are upgrading to a larger hard drive and you want to clone your current hard drive. Simply copying the file to the new hard drive won't work. You can download Carbon Copy Cloner here from MacUpdate. It seems that Mac users either use Spotlight constantly or never use it. A lot of people asked me if it is possible to hide the Spotlight icon that is in the menu bar. At that time, I didn't know of any way, but the free application called OnyX was just updated to add this feature. To hide the icon, you have to go in the new "Spotlight" tab that is in the "Parameters" tab. From there, you can choose to "Hide" or "Show" the Spotlight icon. This feature won't be in the app if you don't have the Version 1.9.6b3. 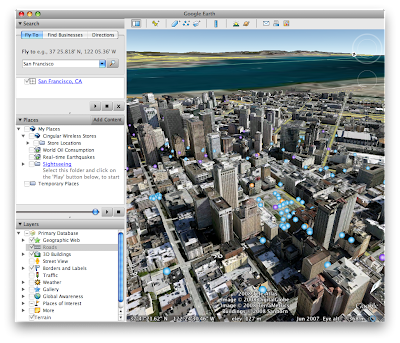 OnyX is available for download here from VersionTracker. The "Option" key in QuickTime! The left and right arrows in QuickTime let you move from frame to frame. If you add the "Option" key however, it will go back to the beginning of the video. The up and down arrow adjust the sound, but with the Option key, they'll mute or turn the sound all the way up. The up and down arrow adjust the sound within QuickTime, not the system sound. 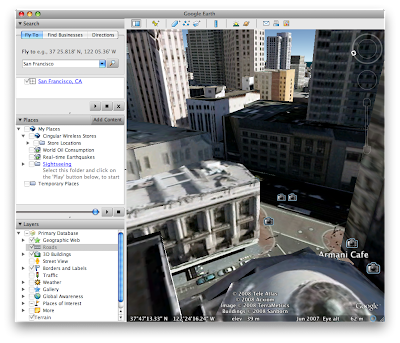 3D buildings in Google Earth! Burning CDs or MP3 in iTunes! 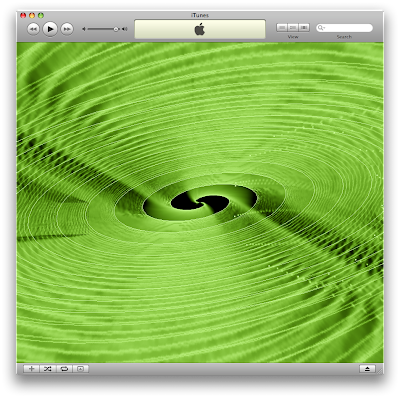 By default, iTunes burns CDs as Audio CDs that can play in any CD player. Many cars now come with an MP3 CD Player and it is possible to burn CDs that contain a lot more songs. It is however not necessary to use an application like Toast to do so. 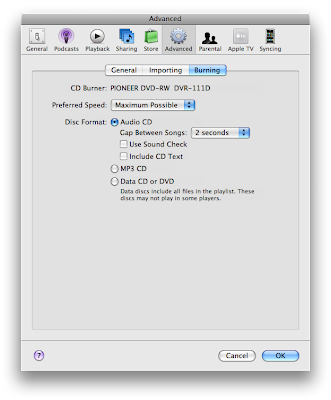 It is possible to modify iTunes' preferences so that it burns MP3 data CDs. You can change it in the "Burning" tab of the Advanced preferences. Growl is a great notifier for Mac OS X and it has some features that can make it even better. If you go in the Growl settings in Apple System Preferences, you can modify the "Network" settings. From there, you can enable "Listen for incoming notifications". This will make your Mac available in "Forward notifications to other computers" on other Macs. It is a great way of having notifications from both a laptop and a desktop show up on both Macs. You can download Growl here from MacUpdate. I heard about this tip on the Tekzilla show (from Revision3) and it was so great that I wanted to post about it here. I often subscribe to two version of the same show (a small and a HD version) because I usually watch the HD version, but if I know I am leaving on a trip, I'll download the iPod compatible version. I usually leave many version unsubscribed and subscribe when I want the latest episode in that version. The only problem is that the latest episode is not always out when I do so. A great way to update the feed is to hold down "Option" and click on the triangle at the left of the name of the podcast. It will update the feed, but it won't download anything. The episodes that are not downloaded will appear grayed out. You can then choose which episode you want to download. Thanks to Tekzilla and Veronica Belmont for the tip! I have tried Twitterrific for a while, but it didn't really worked as well as I had hoped. Firefox 3 came along and it really looked like a good Safari replacement. I just discovered the awesome Firefox add-on called TwitterFox. For how long I have been using it, it works a lot better. It is also fully updated for Firefox 3. You can get TwitterFox here from Mozilla's website. 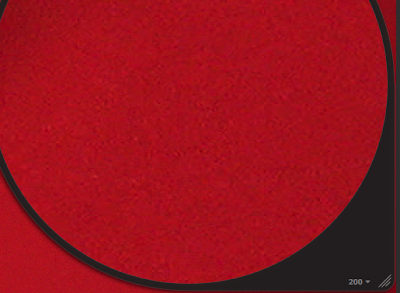 The loupe in Aperture changed style in Aperture 2. It is however possible to use the Aperture 1 loupe. 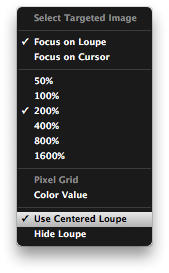 To do so, you can click on the zoom percentage (50, 100, 200 etc) and uncheck "Use Centered Loupe".